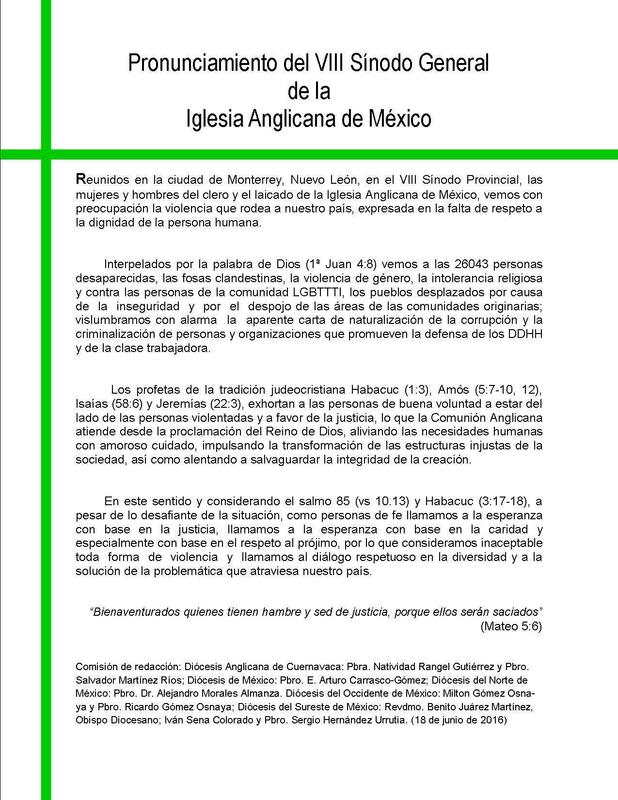 Gathered in Monterrey City, Nuevo León, at the Eighth Provincial Synod, the men and women of the clergy and laity of the Anglican Church of Mexico state their concern about the violence taking place in our country, expressed in the lack of respect for human dignity. Challenged by God’s Word (I John 4:8) we see the 26043 missing people, the clandestine graves, gender violence, religious intolerance and bias against LGTTTBI persons, peoples driven from their lands on account of insecurity and the plundering of their original community areas. We also alarmingly foresee the apparent naturalization charter of the corruption and criminalization of people and organizations that promote the defense of human rights and the working class. The prophets of the JudeoChristian tradition: Habakkuk (1:3); Amos (5:7-10; 12), Isaiah (50:6) and Jeremiah (22:3) urge the people of good will to side with the victims of violence and to be in favor of justice, sommething that the Anglican Communion embraces from the proclamation of God’s Kingdom by tending the needed with loving care, fostering the transformation of the unjust structures of society, as well as by encouraging all to safeguard the integrity of creation. In this respect, pondering on Psalm 85 (10-13) and Habakkuk (3:17-18), despite the challenge posed by the current situation, we, as faithful people, make a call for hope based on justice, based on charity, and particularly, based on respect for our neighbor. We therefore deem unacceptable every form of violence and make a call for respectful dialogue in diversity and for the solution of the problems our country is going through. Drafting Committee: Anglican Diocese of Cuernavaca: Rev. Natividad Rangel Gutiérrez and Rev. Salvador Martínez Ríos. Diocese of Mexico: Rev. E. Arturo Carrasco-Gómez. Diocese of NorthernMexico: Rev. Dr. Alejandro Morales Almanza. Diocese of Western Mexico: Milton Gómez Osnaya and Rev. Ricardo Gómez Osnaya. Diocese of SoutheasternMexico: Rt. Rev. Benito JuárezMartínez, DiocesanBishop; Iván Sena Colorado and Rev. Sergio Hernández Urrutia. (June 18, 2016).